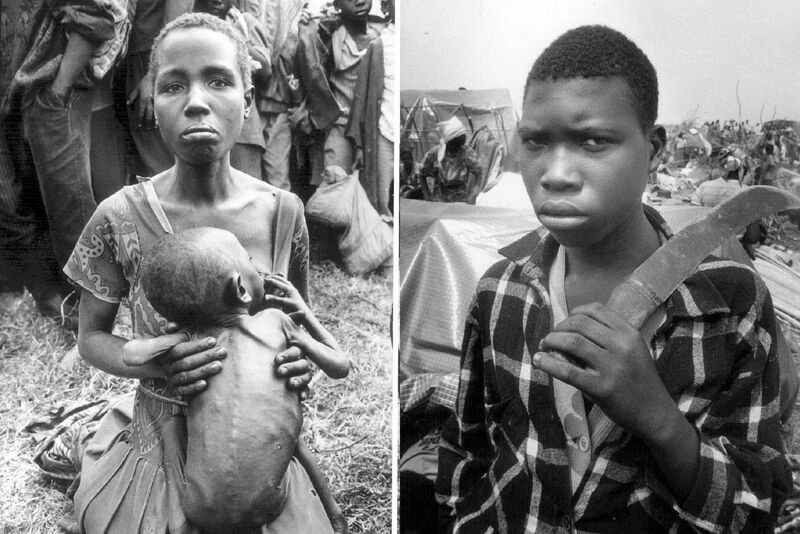 In 1994, Rwandan refugees take shelter in a camp in the Democratic Republic of the Congo, then still known as Zaire. This picture was taken by freelance photographer Russell Monk, who spent three weeks in Rwanda and Zaire covering the conflict for The Globe and Mail. You can see more of his harrowing images of the genocide's human toll at the end of this article. It has been 25 years since more than 800,000 people were slaughtered in Rwanda during one of the worst genocides of modern history. The tiny, landlocked, central African country had been fraught with ethnic tensions for years, in part because the Belgians, who were the colonial rulers after the Second World War, favoured the minority Tutsis over the Hutu majority. Those resentments boiled over in 1959 when the Hutus rebelled, violence erupted and hundreds of thousands of Tutsis fled to safety across Rwanda’s borders. Belgium granted the country independence in 1962 and the Hutus took power. But hostilities did not end. The Tutsis reorganized and invaded in 1990, setting off a civil war that lasted for two years. Juvenal Habyarimana, a moderate Hutu who had been president since 1978, signed an agreement in 1993 that allowed for power to be shared between the Tutsis and the Hutus. But that just inflamed Hutu extremists. 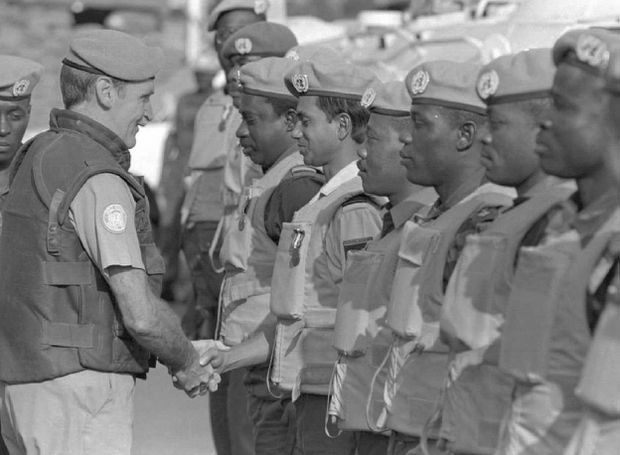 Kigali, June 26, 1994: Gen. Roméo Dallaire of Canada greets UN peacekeepers during a ceremony recognizing their services in Rwanda. Roméo Dallaire, the Canadian lieutenant-general who was leading a United Nations observer force and peacekeeping mission known as UNAMIR, became alarmed when he heard rumours that a genocide was being planned. He alerted the UN in January 1994 but was told not to act. On April 6, 1994, a plane carrying Mr. Habyarimana and the president of neighbouring Burundi was shot down over the Rwandan capital of Kigali, killing all aboard. Some blamed the Hutu extremists. More recent information suggests it may have been the work of the Rwandan Patriotic Front (RPF), a Tutsi militia led by Paul Kagame, who has been the president since 1994. The downing of the plane launched a genocide. Hutus took to the radio and urged fellow Hutus to kill their Tutsi neighbours. Much of the carnage was committed with machetes, and hundreds of thousands of Tutsis, who are generally taller than Hutus, were literally chopped off at the knees or massacred in the most brutal fashion. Many moderate Hutus were also killed. At the peak of the slaughter, which lasted more than three months, more than 8,000 people were being murdered each day. Lt. Gen. Dallaire requested a reinforcement of 5,000 troops in April. The UN instead pulled out of Rwanda. Meanwhile, a civil war was being waged between the RPF and the Rwandan armed forces and others. By early July, the RPF gained control of most of the country. Afraid of reprisals from the Tutsis, more than two million Hutus fled for the borders. Many ended up in refugee camps in Zaire, which is now known as the Democratic Republic of the Congo. The exodus created another humanitarian crisis. It was into this situation of widespread death and mass migration that Canadian soldiers were dropped in July 1994 to start a new mission known as UNAMIR II. July, 1994: Masked men carry a cholera victim away in the Goma refugee camp in Zaire. Writing for The Globe and Mail on July 30, 1994, photographer Russell Monk described the deadly hazards of disease, famine and overcrowding that refugees faced in the camp. Excerpt from that piece are included throughout the gallery below. It was on a Goma street that I got my first close look at multiple deaths. The body count was over 80, mostly women and children. There they lay, trampled to death ... I remember thinking what a cruel twist of fate. Some of these people must have walked hundreds of kilometres to reach a safe haven, only to die like this, trampled to death by their own countrymen as the mortar fire fell. A boy lies dying at start of a cholera outbreak at the refugee camp near Goma, just as Red Cross food began to arrive. That evening I transmitted a photograph back to The Globe and Mail. First it went to London, then to Washington, then to Canada, all in a matter of minutes. The photograph showed a young boy dying of starvation and thirst while lying only a matter of feet from hundreds of sacks of rice and grain. It took over a week for that food to arrive. At left, a woman consoles her daughter, thought to have caught cholera, at Kibumba refugee camp. At right, a machete-toting Hutu man at the Goma camp. Soldiers walk among a group of refugees crossing into Zaire. During the conflict, refugees sometimes streamed across the border at the rate of 10,000 per hour. Human columns were still streaming through the border. To one side I saw what I thought was a rubbish heap. When my eyes focused through the acrid haze caused by dust and wood smoke, I realized what had happened. The mortar fire I had heard had landed in the midst of people walking through the night, and I could see bodies, dozens and dozens of bodies, maybe hundreds. I could describe what they looked like but I don't think you want to know what a little girl resembles after she has been hit by mortar fire. Back in the Rwandan capital, Kigali, thousands of orphans like this one remained during the conflict. Some were desperately ill. It may sound strange, even callous, but as I sit here in emotional decompression, I cannot help but think of the dying faces that I focused my camera on, and wonder at the process that has been triggered in my conscience. Grace, at the end, is a universal desire. None of us wants to die an anonymous death. That is as far as I’ve got. A man is overwhelmed by despair in Zaire's Minigi refugee camp, also known as Camp Cholera.